Spacechem is one of those games that intrigued me from the moment I saw screenshots, because it didn’t much look like any other game. I probably would have bought it eventually out of curiosity even if it hadn’t been bundled. I had some problems at first getting it to behave properly: even after exiting the app, whatever dreadful things it was doing to my video card persisted in some way, making Firefox show up split diagonally into normal and all-black triangles. But the Steam support forum recommended a small modification to the config files, and that seems to have taken care of it. I’ve spent a couple of hours on it by now, long enough to get a good idea of how it plays, although in some ways it feels like I’m still in a tutorial. This is a game that keeps on introducing new complexity for a good long time. It strikes me as a game designed by and for computer programmers. At its core, it’s about creating processes for assembling molecules, using a sort of 2D programming language with two threads of execution, like a concurrent version of Befunge. You have a grid and two cursors, one red and one blue, that move along looping tracks that you can set up however you please by placing arrows that make them change direction. Each grid cell can contain at most one redirection arrow per track, and also at most one command. These commands are what you use to assemble molecules out of atoms. 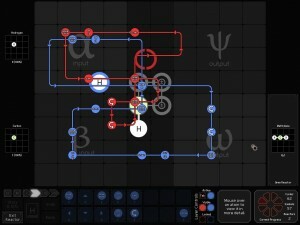 You have commands to release an atom or molecule to a specified input area, to pick up and drop whatever is in the same spot as the cursor, to deliver completed molecules you’ve dropped in the output areas, and to use the “chemical bonder” tool, which has a fixed location on the grid, to connect or sever atoms sitting on it. The chemical bonder is of course not how chemical bonds are made in real life, but that’s okay, because you’re not making real molecules. You’re making chemical diagrams, 2D pictures made of letters and lines, with everything sitting in a single plane and joined at right angles. But unlike the pictures in your chemistry textbook, it’s not just a simplifying abstraction: the geometry of these pseudo-molecules is important to gameplay. Each atom takes up one cell of the grid, making you shift and rotate molecules on the bonder. The developers call this “fake chemistry”. A working chemical process, once you get it going, moves like a robotic assembly line, and can be made to go at various speeds, the lowest speed being mostly useful for debugging. It seems like every puzzle requires you to make 40 of the target molecule. At first it seemed like this was just a way to give you an opportunity to admire your machine in operation, but it’s also a test to see if it can iterate effectively. Your first iteration isn’t necessarily like subsequent ones, due to timing issues and the possibility of atoms crashing into each other. Campaign mode is separated into nine chapters, or planets. I’ve completed the first two, but I don’t think I’ll be rushing through the rest, like I do for so many puzzle games. It’s already becoming intimidatingly complex. I suspect that I’m making things more complicated than they need to be, though, due to inexperience with the optimization tricks peculiar to this system. You’re not overcomplicating things, SpaceChem introduces a new concept basically every level. It quickly gets intimidatingly complex. That’s part of the fun, of course. I think a big part of the fun of the game is just watching your rube-goldberg plan just somehow work. It gets quite difficult, but never to the extent where there’s only one way to do anything, so if you don’t care about score, you can get away with overcomplication.